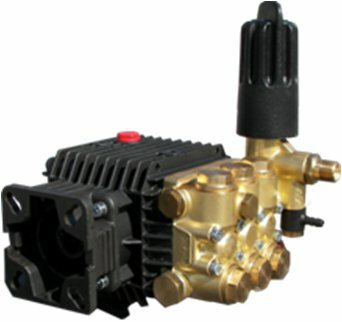 TP Series 51, Triplex Plunger Pump, Hollow Shaft, Flanged for Direct Couple to Gasoline Engines. New, oversized connecting rods for ultimate crankcase performance. Forged brass manifold with an exclusive lifetime warranty. Max. Inlet Pressure: 80 PSI Max. Fluid Temperature: 165° F Inlet Port Thread: 3/8" - 19 BSP-F Discharge Port Thread: 1/4" - 19 BSP-F Shaft Diameter: .750 in./19 mm. Pump Dimensions: 7.0" x 7.2" x 5.5" Max. Inlet Vacuum: 3 ft. water (2.6 in. Hg). Crankcase Oil Capacity: 11.0 oz. Built in Unloader and Chemical Injector.